Edgar “Saner” Flores is an urban artist, illustrator and graphic designer. Raised by his parents in Mexico City and surrounded by rich color and tradition, Saner developed an interest in drawing and Mexican muralism early on. He began expressing himself on paper and through graffiti art, later going on to earn a degree in graphic design from the Universidad Autónoma de México. 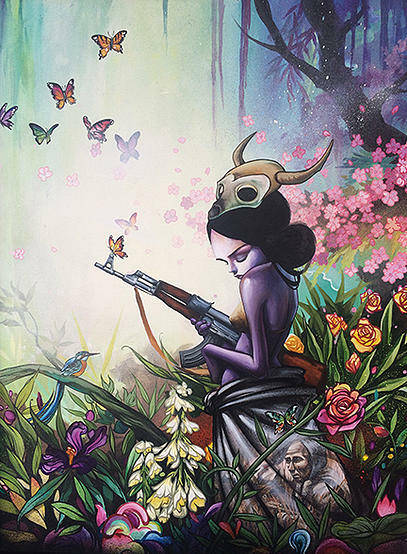 His creations are influenced by Mexican custom and folklore, color, mysticism, masks and skulls. A mix of these lifelong interests and passions has led him to become the artist he is today. 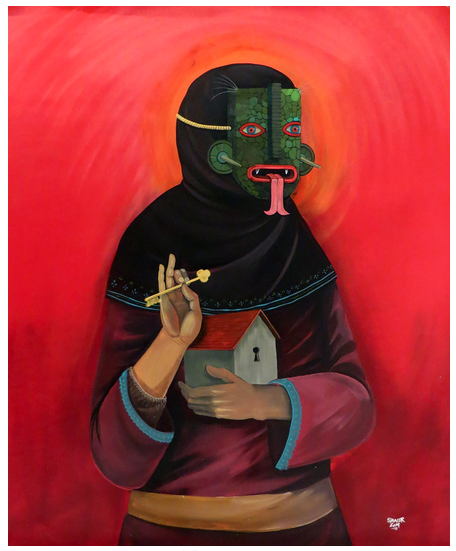 Saner’s work has been featured in galleries in Mexico, the United States, London, Berlin and Barcelona. He has collaborated with Kidrobot, Vans, G-Shock, HQTR Canada, Pineda Covalin, Persigna Store, Bacardi, Adidas México, Televisa, and many others. Born Daniel Munoz Rodriquez, San is an internationally recognized and commissioned illustrator, painter, and street artist. Born in a small Spanish village near the Portuguese border, San currently works and resides in Madrid. His artwork is influenced by magical realism, graffiti, and culinary arts. San has shown his fine art internationally, as well as his street art in cities across Europe. Born in the American heartland to hippy, naturist parents, one of Sage Vaughn's earliest memories is sketching animals at the local zoo alongside his father. In adulthood, as an acclaimed painter, he contrasts the natural world against melancholic backgrounds featuring the post-industrial landscape. "I'm interested in man's wild side, and animals' civilised aspects … where society and the wilderness overlap", he says. A typical example is Sage's pictures of garden birds with discreet tattoos reading for example, "Kill 'em All" or "FTW". He has claimed to paint wearing infra-red night vision goggles, "as this is how most animals see the world." Incurably romantic while never resorting to schlock, Sage's work also encompasses the intensity, hopes and losses of childhood, plus more recently a sense of humanity and community against the odds. Effortlessly combining a lightness of touch and a sense of drama, it encompasses painting, sculpture and installation work including recreations of childhood dens and gaily-painted baseball bats with six-inch nails driven through them. In January 2013 he first exhibited pieces made from stained glass. The drips that are a consistent part of Sage's paintings are a reference to not only his younger years as a graffiti artist, but also the inexorable marches of time and cycles of nature. His Butterfly Ringcompositions, resembling a mournful wreath of the winged insects associated with optimism in classical mythology, are among his most popular pieces. In 2011 Sage Vaughn's work Integrity, created alongside photographer Michael Muller, adorned the cover of rock band Red Hot Chili Peppers' single Monarchy of Roses. His most recent triumph is MOCA Gallery's Transmission event, curated by Sage's childhood hero, Beastie Boys founder member Mike Diamond in December 2012. He lives and works in California. Ryan Jacob Smith was raised in Orange County, California, and spent his younger years rock-collecting, skating and cub-scouting. In 2001, he graduated with honors from the Art Center College of Design in Pasadena, California. His narrative work explores themes ranging from the earth and its environment to consciousness, the human body, survival and hurt and healing. 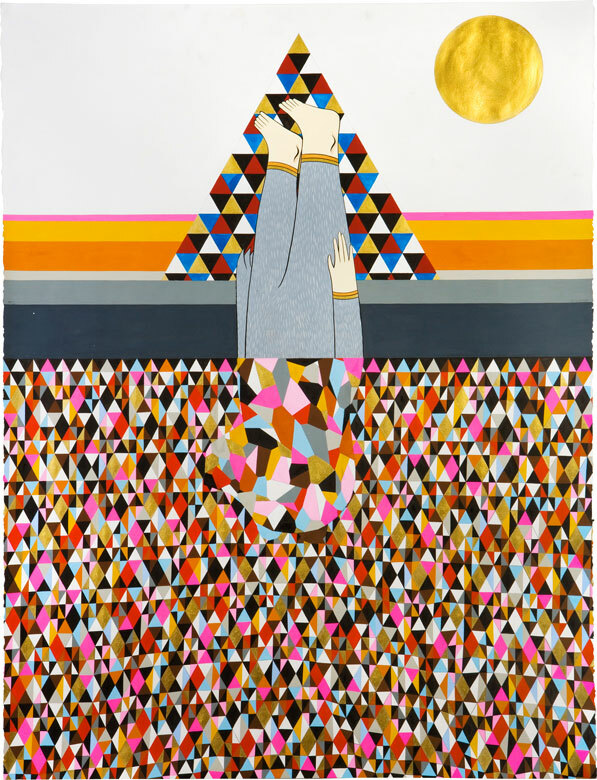 Incorporating illustration, painting, and collage, his work is a blend of intention and improvisation. Fragments, mistakes and unconscious marks remain in each piece, revealing the process and of their development. With a combination of acrylics, spray paint, silkscreen and graphite, Ryan’s work is as much informed by the street culture of his youth as his formal fine art training. Ryan Jacob Smith currently lives in Portland, Oregon where he enjoys collecting old science books and ephemera from thrift stores, skateboarding and buying records. 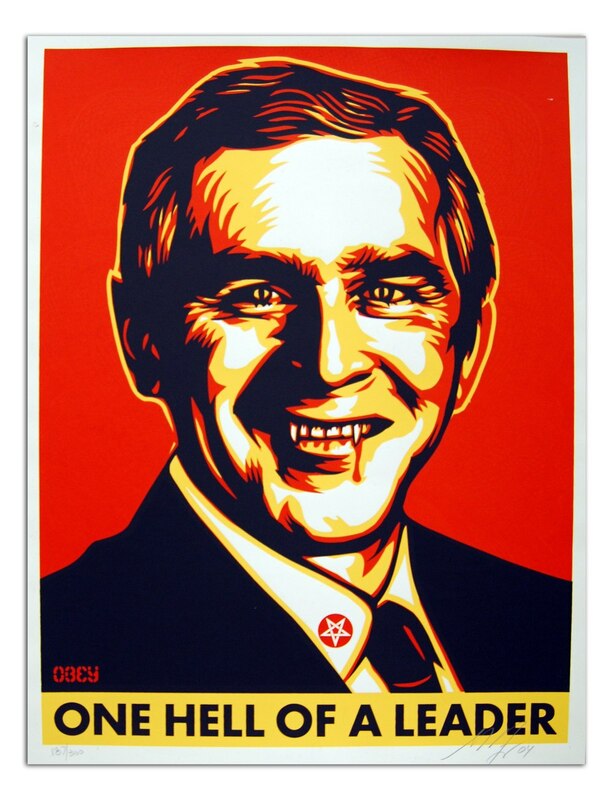 Ron English is an American contemporary artist who explores brand imagery and advertising. 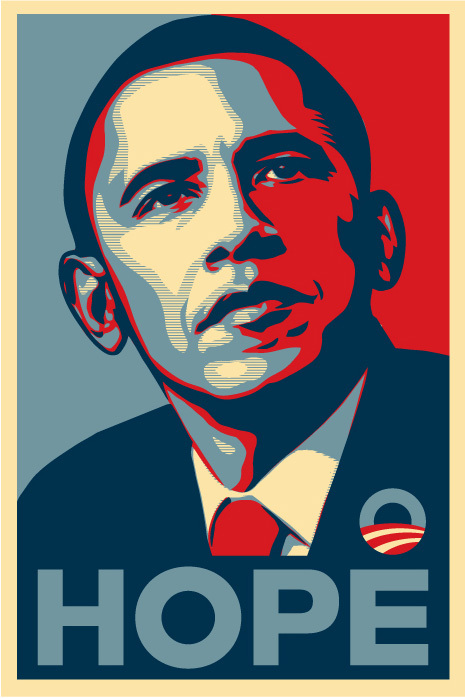 He is known for the use of color and comic book collage. Other characters carousing through English’s art, in paintings, billboards, and sculpture include three-eyed rabbits, udderly delicious cowgirls and grinning skulls, blending stunning visuals with the bitingly humorous undertones of America’s Premier Pop Iconoclast. English was one of the on-camera subjects interviewed for the documentary Super Size Me (2004), which showcased his McDonald's-themed artwork -- inspired by English's belief about the effect of fast food franchises andrestaurant chains on the American culture. Rob Abeyta Jr. is painter, designer and art director living in the harbor area of Los Angeles. Currently, he is working with NIKE as the senior designer on a new line of sneakers & apparel to rollout later this year. In addition, he is a member of SA Studios creative team with Mr. Cartoon and Estevan Oriol. His past works have included collaborations with Spike Jonze, French Director and Academy Award Winner Michel Gondry and numerous music packaging designs ranging from the seminal punk band LOS CRUDOS, to The Transplants, to LA hip hop legends MACK 10, Cypress Hill and DJ Quick. Other works include the design of numerous skateboards and apparel while working as an Art Director for Fourstar Clothing at the Girl Skateboard Companies. While design and art direction take up his days, the nights are taken up by learning the process of tattooing with Mr. Cartoon. Dr. 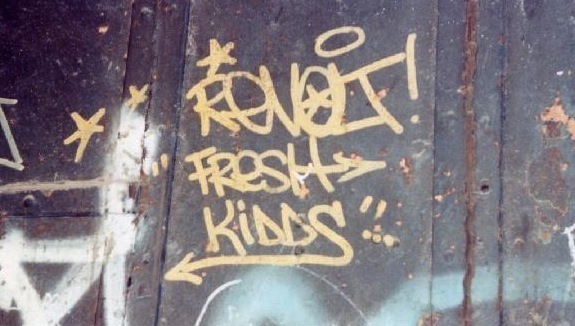 Revolt began his practice in 1977 as an original member of the historic New York City graffiti crew, The Rolling Thunder Writers (RTW). Known for doing both tags & elaborate & colorful pieces, he developed his reputation by taking over the Broadway #1 line with his colorful psychedelic & comic art influenced stylings & later, taking it "all-city". With his contributions to the seminal classic hip-hop films "Wild Style & "Style Wars", various music videos & his tour of duty in Baltimore where he, like a "messenger of style" single handedly kick-started a graff-scene that still feels his influence today, his place in the history of graff-dom is secure. Today, Dr. Revolt's accomplishments far surpass his early NYC beginnings. In addition to designing several t-shirts, album covers, & logo work for various artists including: THE FUN LOVIN' CRIMINALS, THE BLACK CROWS, CAMP LOW, GRANDMASTER FLASH, SLY-n-ROBIE'S TAXI DJ. LINK, SKARhead, etc. & creating the classic "YO! MTV Raps' logo, his work has been, & continues to be seen in various publications & art galleries globally. Rene Almanza graduated from the School of Visual Arts of the UANL (Universidad Autónoma de Nuevo León). He began working during his adolescence as a visual artist; first in graphic novels, underground fanzines, the newspapers of Monterey, and later in printed media mainly designing signs. 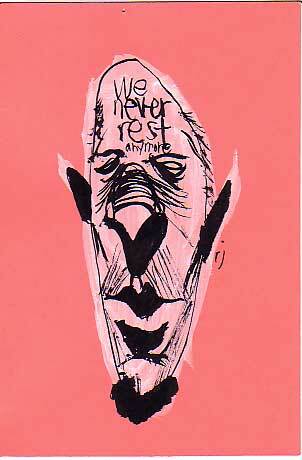 In 2000 he joined the editorial or political cartoon department of the group Reforma (which included the newspapers El Norte of Monterrey, Reforma of Mexico City, The Mural of Guadalajara, and Palabra of Saltillo), illustrating various articles in these newspapers. For two years he was in charge of illustrations in the cultural section of the newspaper El Norte, where he received 6 awards for his work from SND (Society for Newspaper Design) based in New York, which every year rewards the most outstanding international work in photography, design and editorial illustration. After three years with the group Reforma, he joined the “Shinseken” Editorial group of Tokyo, Japan, working in a project which collected folk tales from around the world to condense them into a collection of illustrated books, published in five languages. Once the project was completed he moved to Oaxaca. He is a founding member of Galería Arte Cocodrilo (Crocodile Art Gallery), and the graphic arts studio Pata de Perro ( Dog’s leg), independent spaces dedicated to the diffusion of emergent visual arts in the Oaxaca area. Currently he is working with the publishing house Sirpus (Barcelona, Spain) in collaboration with linguists from the Colegio de México, illustrating a series of bilingual books on the history of the Zapotec communities of Oaxaca. His work can be found in numerous private collections in Mexico, the United States, Argentina, Chile, Canada, France, Spain, Switzerland, Germany, Italy, Holland, Morocco, Australia, Japan, Bangladesh, China and Vietnam. 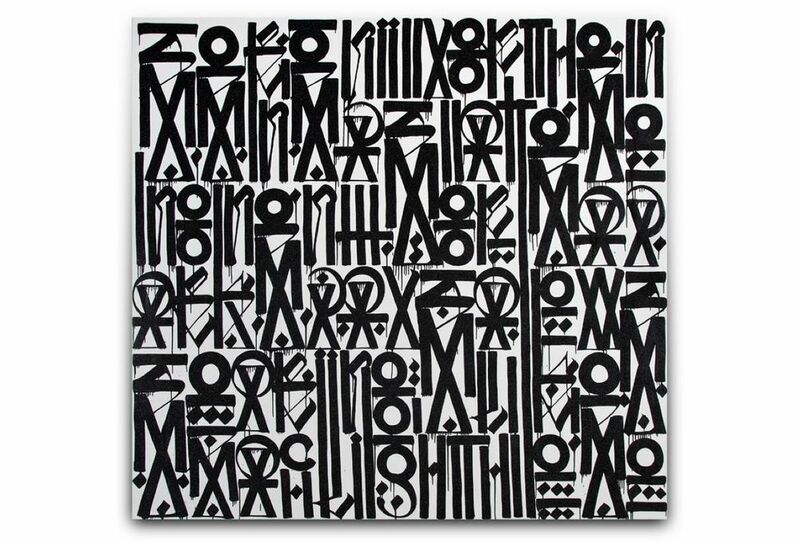 Lin Felton aka QUIK is a painter and graffiti artist from New York. He was born in Queens in 1958 and started using graffiti to display his art in subways. He is known for his comical and satirical style that is known to be arrogant. Felton started tagging the walls of Queens at the age of 10, taking the name Star10. His fascination for this world started when he saw the metro trains in movement covered in tags. He then changed his name to QUIK and signs wherever he can. Richard "Richie" Mirando, known as Seen UA, born 1961 in the Bronx, New York City, is one of the most well known graffiti artists in the world, often referred to as the Godfather of Graffiti, although he did not pioneer the movement. 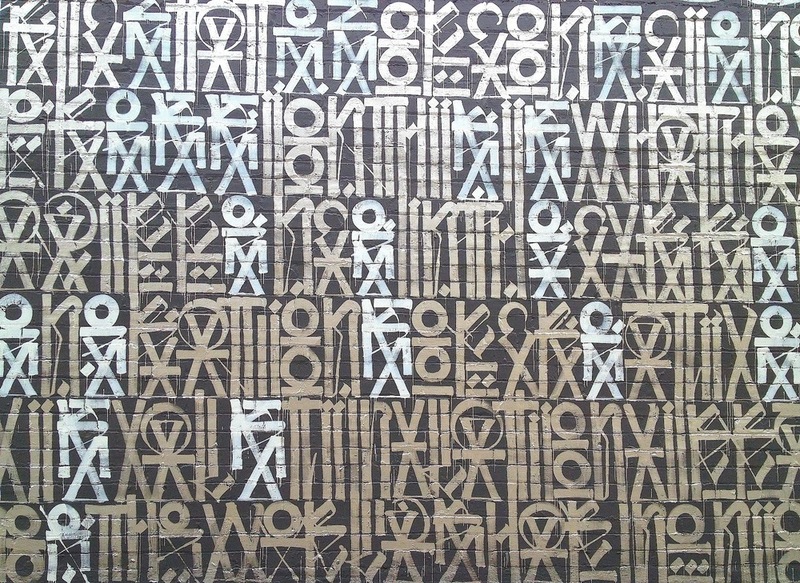 Seen first started to paint on New York City subway system in 1973. His crew United Artists (or simply UA) quickly gained the reputation for producing full-color throw-ups on whole cars with members such as Pjay, Duster, Sin, and his brother Mad.